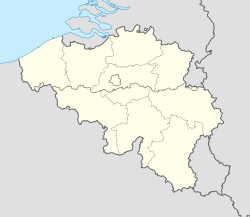 Fosses-la-Ville (Walloon: Fosse-li-Veye) is a Walloon municipality located in the Belgian province of Namur. On January 1, 2006, Fosses-la-Ville had a total population of 9,311. The total area is 63.24 km² which gives a population density of 147 inhabitants per km². Collegiate church of Saint-Feuillen, rebuilt in the 18th century. It has maintained a Romanesque tower from the 10th century.